"Give me the $@# money or I gut you like a Targ!" 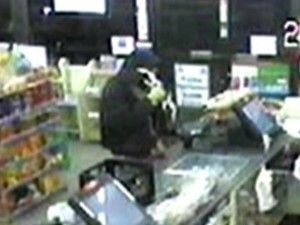 Someone in Colorado Springs, Colorado robbed two 7-11 stores with a sharp object being portrayed in the media as a Klingon Bat’leth. The Denver Channel had the first writeup of it that I’ve seen, and has some of the most hilarious blog comments. 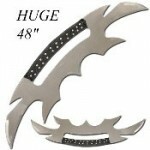 As one reader in the blog pointed out it i’s not a Bat’leth but appears to be some sort of cheap knockoff. So I thought, what does a Bat’leth run these days. 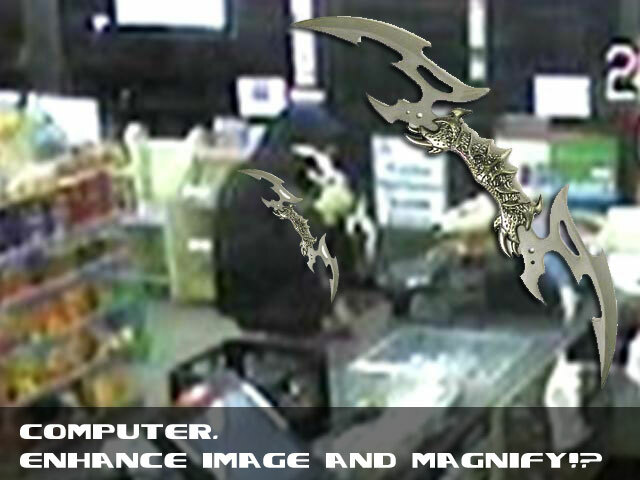 I mean, if you were planning on robbing some 7-11’s, you would probably not want to do it with a lousy knockoff Bat’leth and be the laughing stock of the internet. Well, I didn’t really find out the answer to that question, but I did find some cheap knockoffs. Here on the left is the Sword of Kahless (picture borrowed shamelessly from Memory-Alpha, who borrowed it shamelessly from Paramount) from the DS9 episode of the same name. It’s made from the lava-doused hair of Kahless the Unforgettable, who slew the gods and forged the Klingon Empire. 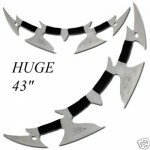 This next Star Trek Klingon Bat’leth & Plaque Overall Length: 24″ listing on ebay, not only fails to fall short of the 116 centimeter requirement, it also doesn’t even match the picture with the description. 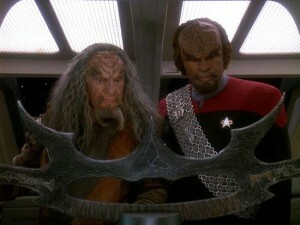 The bat’leth, or “sword of honor”, is a traditional Klingon blade weapon. Resembling a crescent-shaped, two-ended scimitar, the bat’leth is wielded using three handholds along the outside edge of the blade. 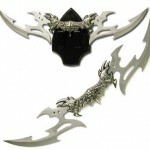 It is widely considered the most popular weapon among Klingon warriors. So… wait… where’s the other two handholds? Oh wait, you were just copy-pasting the entry from Memory-Alpha into your item writeup. Seriously guys, the one handhold is a dead giveaway. In a slightly related thread, my problem with the fradulent Star Trek Voyager DVD set is all resolved. I have gotten my money back from the original seller and purchased it directly from Amazon instead at the usual exhorbant retail price. 🙁 I’m still slowly binging my way through the first season. Armrha has pointed out that the “$25 Sword of Honor” picture looks a lot like the weapon of choice! I put together this composite image, and it looks like a pretty good match.